World Buyers is proud to offer an incredible selection of wholesale butterfly gifts, accessories and décor. Whether you’re looking to add a distinct design to your own space, or you’re looking to provide your customers with a wide selection of insect-themed décor and kitsch, World Buyers is your go-to for anything and everything butterflies. You’ll find museum-quality framed butterfly specimens, butterfly garlands, butterfly-themed dishware, butterfly frames and more. Our butterfly sets are collected from butterfly farms and are professionally mounted and identified. 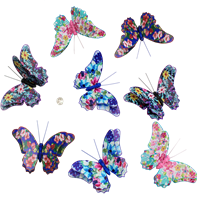 World Buyers is the best source for wholesale butterfly gifts. These butterflies have several wing layers for 3D effect. Festive, glittery and bright! Price Shown Nearly 60% Off! Butterfly garland in spring colors of lavender, fuchsia and pink. No glitter. Clearance Price Shown Now 50% Off! Vibrantly colored 3D paper butterfly garland. Watercolor rainbow colors. 8 butterflies on each garland. Fantasy Sky Butterfly Garland with pastel pinks, purples, blues and white. Feather wings. 8 butterflies on each garland. Colorful butterfly garland made of sturdy paper with lovely garden florals. Each butterfly has two sets of wings! No glitter. Clear mylar butterfly garland with blue and black print. No glitter. Butterfly garland made of feathers with multi-color fantasy print. Base colors are aqua and black. No glitter. This is one of our most popular monarch style garlands. Medium size butterfly width is 4.5"
Thousands used at White House state dinner welcoming Mexico's president symbolizing the Monarch's annual migration to Mexico! Pink mesh butterfly with Glitter.